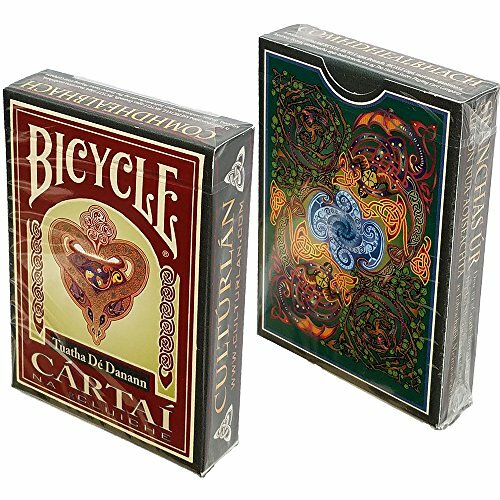 A Bicycle® playing card deck inspired by Celtic history and legend. Artwork and design by medieval studies professor, Dr. James Acken. These standard playing cards feature imagery from traditional Celtic mythology. Drawing equally on medieval stories from Ireland and Scotland and classical Celtic iconography, the Celtic Myth decks feature the most accurate portrayal of such legendary figures as the Morrígain, Lugh, Cú Chulainn, Fionn MacCumhaill and other lesser known but equally important faeries and heroes. The Celtic Myth deck is the perfect entry-point for those wishing to learn more about Celtic mythology or gift for those who have a deep and abiding interest in all things magical and beautiful. Original artwork designed for this deck featured on Court (i.e. Face) cards, Jokers, & card-backs. Portraits and names of some of the most important faeries, kings and heroes from Celtic legend. Standard 52 card poker deck + Jokers. Linen finish and cellophane wrapping. Manufactured in the USA by the United States Playing Card Company (USPCC) under the Bicycle® brand.